Rima Kallingal and Manju Warrier give powerhouse performances in Rani Padmini, raves Paresh C Palicha. Director Ashiq Abu takes up the gamble of making a film with no male superstar. Rani Padmini is a film made with his wife Rima Kallingal and Manju Warrier in the title roles. They play two contrasting women brought together by fate. Rani (Rima Kallingal) is tomboyish and ready to take up cudgels against anyone to prove a point. Padmini is an introvert. Rani has grown up in Delhi without any male protection while Padmini grew up in a traditional household with her father, who is a practitioner of Ayurvedic medicine. Padmini shifts to Delhi after getting married to Giri (Jinu Joseph). Giri is a car rally enthusiast and has been a consistent winner of the Great Himalayan car rally. Giri’s mother (Sajitha Madathil) got the couple married, as she wanted a daughter-in-law who would accompany her son to the car rallies. But after marriage, Padmini, a physiotherapist, wishes to work in a hospital. So Giri signs a divorce petition at the behest of his mother before leaving to participate in the Himalayan car rally. Padmini gathers courage and catches the next bus to Manali, the starting point of the rally. She meets Rani in the bus, and their adventurous journey through the northern India begins. Rani's back story is that she's gotten into trouble with a self-styled goon, and she was running away to save her life. Both the female leads give powerhouse performances. The film has humour that ranges from subtle to slapstick. Dileesh Pothan, as a Malayalam news reporter covering the car rally and Soubin Shahir as his cameraman, bring the house down. 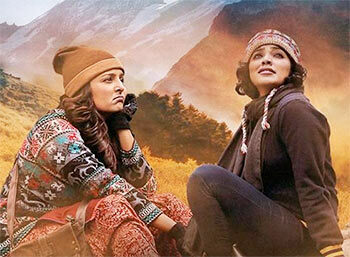 The film presents enthralling visuals of the snow-capped Himalayas and the verdant surroundings. Ashiq Abu has given us a real entertainer in Rani Padmini.